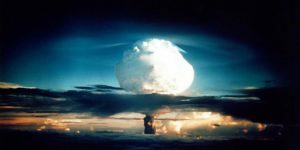 A new report from the Center for a New American Security warns that the proliferation of weapons of mass destruction (WMD) will continue if states don’t create the legal frameworks necessary to prevent the flow of resources and finances to support production of WMDs. The report, Financial Networks of Mass Destruction, describes the current legal framework that allows terrorism financing to occur as a result of large gaps in oversight, control, and implementation of existing regulations and sanctions. Non-state actors pose an especially difficult regulatory concern and are a primary means through which states procure resources and financing. Banks are noted as important players in monitoring the movement of finances, but lack of transparency and new financial technologies that facilitate anonymity make the process difficult. Banks have indicated a desire for clearer regulations and guidance in countering proliferation finance. The largest obstacle to countering proliferation financing is the lack of political will. Failure to prioritize counter-proliferation efforts and failure to recognize the importance of doing so prevents nations from investing effort into strengthening the global network of counter-proliferation finance. As the largest global economy, the US must take a lead role in curbing illicit flows that help to finance proliferation. It can do so by focusing on national legislation, and current US Treasury leadership in the Intergovernmental Financial Action Task Force (FATF). However, the report notes that the year-long leadership terms are an obstacle to developing and implementing any real reform. China will assume leadership in the FATF in mid-2019. The US must take the helm in creating a stronger global framework for countering proliferation finance through education, awareness, strong national policies, modeling effective practices, guiding the private sector and financial institutions, and challenging state actors to prioritize the issue. Leadership in the 2018-2019 FATF is a window of opportunity the US must take prevent the spread of weapons of mass destruction. Some of the links in this report require institutional access, click here to read the full report, and a summary of the report here.